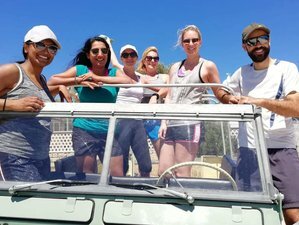 Join Adventure Boot Camps Spain in Javea, the jewel of the Costa Blanca, for the most diverse and unique boot camp experience in Europe. They have everything you're looking for in a fitness-based holiday including Vinyasa yoga, Aerial yoga, spinning, beach circuits, BoxFit, kickboxing, Jiu-Jitsu, CrossFit, Pilates, HIIT, and much more. Added to this, you'll get one adventure activity per day including coastal and mountain hikes, mountain biking, sea kayaking, stand-up paddle boarding, climbing, and abseiling. You will stay in the large six-bedroom villa in a peaceful area just five minutes from Javea's main amenities and beach. The limit of the group sizes is 10, which along with staying in a villa instead of hotels, gives a nice family and team feel to the whole boot camp experience. Each individual gets the care and attention they need and no one gets lost in an over-sized group. You have the option of having your own private double room or, at a discounted rate, share a double or twin room. Bathrooms are shared. Cleaners come in once a day to give a general clean including the bathrooms and to change any towels that need changing. Amenities include swimming pool, al fresco dining and BBQ area, air-conditioned rooms on the main floor, extensive gardens, free Wi-Fi and full UK and Spanish TV. You can enjoy all of these amenities in the company of our friendly furry feline friends Gizmo and Barry! The fitness and adventure boot camps are completely all-inclusive, no hidden extra costs. You will stay in the luxury villa in a peaceful location just five minutes from the beach. All healthy and nutritious meals are included as are all the fitness sessions and adventure activities. Airport transfers are included in the price, but you will need to organize your own flights in and out of Alicante airport. Adventure Boot Camps Spain believes that diversity and enjoyment are the key to a healthy and fulfilling lifestyle. Their idea is for everyone to try the range of activities they put on with the hope that you may go home having found something you love doing and implement it into your everyday life. They're passionate about what they do and are lucky enough to live this lifestyle every day. They want to pass on their enthusiasm and expertise in giving you an amazing once in a lifetime experience. Luke is an avid sports enthusiast. Following a serious knee injury, he has since forged a career as a successful personal trainer. He gained his eReps level 4 personal training back in 2010 and has achieved numerous certificates in sports-related elements since. Luke is a very hands-on, personable guy, passionate about health and fitness and guiding others to achieving their personal goals. Luke will be coordinating the boot camps and making sure everything runs smoothly as well as taking a hands-on approach with the training sessions and activities with the rest of the team. Your fitness and adventure boot camp holiday will take place in the small, historic beach town of Javea (also known as Xabia), lying on the most eastern point of the Spanish coastline. Javea boasts an average of nearly 320 days sunshine per year and is often referred to as the 'jewel of the Costa Blanca'. Although small, this beautiful Spanish town has some of the most scenery in Spain and in just one week, you will see it all while out hiking the famous Montgo Mountain exploring the town by bike or kayaking across the stunning coastline, visiting cathedral-like sea caves. The aim is for you to reach your fitness goals and enjoy the experience at the same time by seeing and doing as much as you possibly can during just one week with Adventure Boot Camps Spain. Prepare yourself for an adventure of a lifetime in paradise. Prepare yourself for an adventure of a lifetime in paradise. Javea is split into three main areas: the Arenal, the Port, and the Old Town. The Arenal area of Javea surrounds the glorious sandy beach of the Playa de Arenal. The entire beachfront of the Arenal is lined with numerous bars and restaurants, offering a wide variety of cuisine. Nutrition is a key part of any healthy lifestyle. They provide you with both nutritious and delicious meals throughout your stay. The food served is simple to make and can be easily followed and implemented into your everyday life back home. This is by no means a detox retreat, far from it in fact. Here, you will eat healthily but also lots as you're going to need the energy to get through an action-packed week of fitness and adventure activities! Vegetarian and vegan options can also be requested. Adventure Boot Camps Spain has a range of spa treatments available from sports massage to beauty therapies. An additional cost will be charged for this. Our therapists can come to you at the villa. Please book your flight to arrive at Alicante International Airport (ALC). Transfer to and from the airport is included Adventure Boot Camps Spain will pick you up from the airport. It is asked if you can find flights both arriving and departing by 3:00 p.m. They realize this isn't always possible so they can be flexible and will arrange for your transfer outside of these times if needed. Your accommodation in Javea is an hours drive from Alicante airport. Valencia Airport (VLC) is another airport you can fly into. However, there could be an additional charge of up to 100 EUR depending on the number of guests needing a transfer from there. Your accommodation is an hour and 15 minutes drive from Valencia airport. Airport: Valencia Airport Airport transfer available: Valencia Airport (US$112 per person) Additional charges may apply. You can request this in the next step. Adventure Boot Camps Spain provides a diverse boot camp experience. Life is for living to the max and keeping fit and healthy should be an enjoyable journey.